Did You Know Brainstorming Is 70 Years Old? That’s right, Alex Osborn started popularizing brainstorming in the late 1930’s. It’s a classic tool I still use, but I have to wonder if there’s something better. Brainstorming is simple, and I would bet this simplicity is the key to its popularity. Yet even the basic rules that Osborn set out aren’t very common. Brainstorming is too often reduced to sitting around a conference table discussing a topic rather than storming an objective. I tried a little experiment with my Business & Design students tonight, introducing them to three different idea generation tools: brainstorming, “yes, and…,” and question the brief. Brainstorming and Yes, and… were slow and stiff. Part of this is probably due to my skill as a facilitator, but I also think these tools require some experience to use proficiently. I liken it to building muscles; it takes some time doing it to see results. Question the brief, on the other hand, more easily generated plenty of usable ideas, and there were even some explicit comments preferring this method, so that we returned to it. My theory is that it’s simple enough to remember but has just enough structure to produce specific kinds of ideas. That’s a balance I’m going to seek with my other concept design tools. See also my concept design page at Smart Experience. 1. Brainstorm all the things you hate about the product/service. 2. Brainstorm the features that would exist in the ideal product/service. I’ve done this four times now with different products and services, but they kick-start themselves and move quickly and leave you with lots of actionable results. 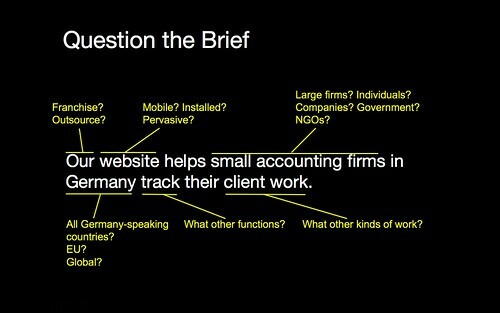 Victor, I really like the “question the brief” structure for ideating and would like to use it in my classes. Do you have any more links or articles on when and how to use it? @Austin — I’ve seen some interesting variations on that. I just discovered a new one this weekend: Lou Rosenfeld wanted to get his 4-year old daughter to use her imagination to play a game. So he said to her, “There’s a new game for 4-year old girls called “Bobulator,” what do you think it does?” She immediately started to describe something, it was awesome to watch. Riffing off a concrete product name is a nice little tool that could be used for idealized design. They arrived with their homework: generating ten different ideas for one type of business. I asked them to do variations on strategy like differentiation, niche, cost leadership, Blue Ocean, etc. with bonus points for sustainability. Each idea was just one sentence. By that point, some variations naturally arose, so I captured those on the whiteboard as shown in the illustration here. Then I would pick one facet of the brief, like the function “track” and ask everyone, “what other functions would be useful in this product for this audience?” Ideally there is some previous research to inform these ideas. But it essentially becomes focused brainstorming at this point, coming up with ideas for one specific facet of the brief at a time.